Stars And Garters: Friday Night Fights: Wright - Round 5: Special "David Goyer Is An Idiot" Edition! Friday Night Fights: Wright - Round 5: Special "David Goyer Is An Idiot" Edition! Bear with me, folks, I have to start this week's round of Friday Night Fights: Wright with a rant. How many of you here have read David S. Goyer's Digital Spy interview about the controversial Man Of Steel ending? For those of you who answered "yes", how many of you are still slamming your head against your desk? Goyer, however, stated that the Man of Steel's moral code "exists outside of the narrative and I just don't believe in rules like that". "We were pretty sure that was going to be controversial," Goyer said. "It's not like we were deluding ourselves, and we weren't just doing it to be cool. We felt, in the case of Zod, we wanted to put the character in an impossible situation and make an impossible choice. Well, at least he didn't call it a "Kobayashi Maru". Still, Goyer calling that an "impossible choice" gives the impression that he's never read a single Silver or Bronze Age Superman story in his entire life. Somewhere Cary Bates is reading Goyer's interview and making the jerking motion. "This is one area, and I've written comic books as well and this is where I disagree with some of my fellow comic book writers - 'Superman doesn't kill'. It's a rule that exists outside of the narrative and I just don't believe in rules like that. I believe when you're writing film or television, you can't rely on a crutch or rule that exists outside of the narrative of the film." "Outside the narrative of the film"? David, this movie introduced us to Clark Kent's parents, his school, and even his CHURCH. And judging by the art on the stainglass windows shown for that aforementioned church, it's the one with the list of 10 Commandments, one of which SPECIFICALLY STATES "THOU SHALT NOT KILL". I'd say that "no-killing" code is pretty damn self-explanatory. Why can't he fly to the moon in your movie, anyway? So apparently Goyer and Snyder's ethos on killing comes from Family Guy. And based on that, should police maybe dig up the backyard of the house where teen Dave Goyer lived? OK, rant over. The reason it's relevant here? 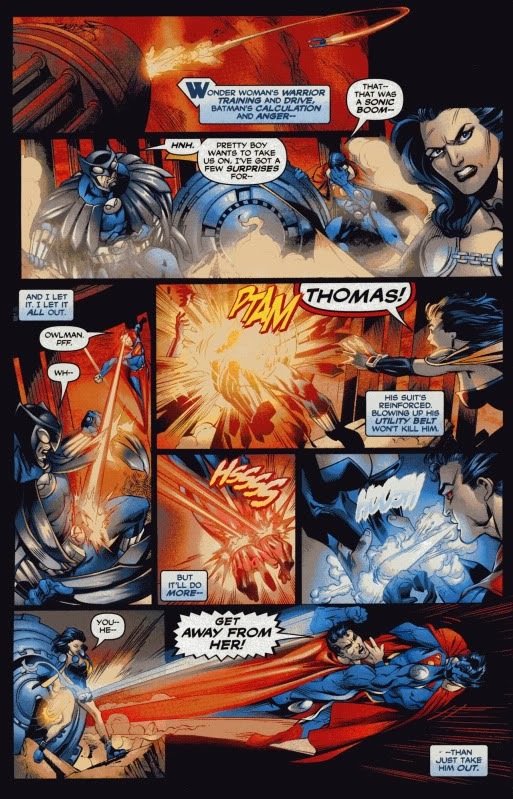 It's because writer Kurt Busiek and artists Mark Bagley and Art Thibert provide us, courtesy of Trinity#13, with a stunningly beautiful rebuttal to Goyer's logic that also happens to serve as tonight's fight entry. 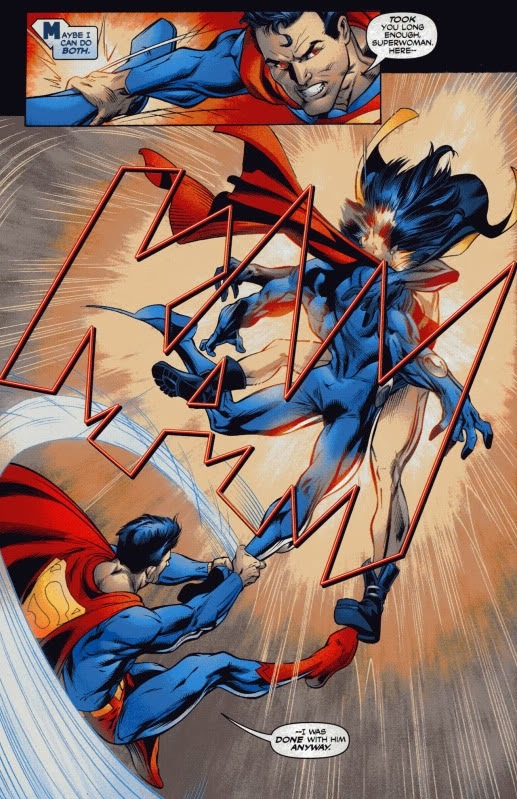 Synopsis: Superman has to singlehandedly face Owlman, Ultraman, and Superwoman, the latter two being as strong as he is. How will he do? But...but...but...Superman not killing is an outside-the-narrative crutch, y'all! Oh, and did he also mention a "mound of skulls"? How prophetic, Mr. Busiek! Tonight's lesson? Not killing your opponents actually makes you a smarter, better hero. And that's one to grow on! Maybe WB should be consulting Busiek on the MoS sequel instead of Frank Miller. Just sayin'. Tonight's fight has music to hurt your alternate self by, courtesy of the Greg Kihn Band. For more nonlethal knuckle sandwiches, click here. And don't forget to vote! I have not seen the new Superman movie, and I hadn't read the article...but I can recognize a load of BS when I see...and smell it. All that blather about being above and beyond the restrictions against killing, is just a feeble-minded way of saying that they wanted some violence and that they were going to do it anyway, regardless of whether or not it made any sense, or was in character. Apparently because, what do all of those silly comic-book writers know anyway? Now Superman is edgy! Dangerous! Why don't they just give him six retractable claws made out of anti-kryptonite while they are at it? So superbly put by you and by Busiek. Sadly rationale like that is not in style over at DC, and to some extent Marvel as well. Damn fine rant as well. I didn't hate the movie, but I didn't love it either. You're right, the whole situation with Zod at the end really was so transparently forced. He could've punched him, gouged his eyes, super freeze his head, something. 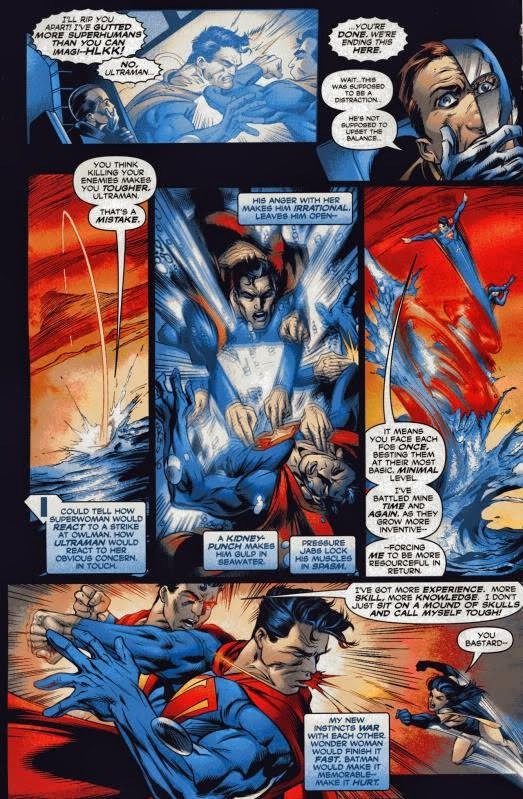 But I do got maybe Goyer's point in that since this Superman was a rookie and didn't have the advantage of having experience in this sort of thing like hos predecessors, such an alternative to killing wouldn't exist in his mind yet, or quick enough.